Then comes the one non-brother, the add-on stooge – Shaul Mofaz-come-lately in the role of pensive Larry. True, Mofaz hasn’t quite mastered his alter ego’s puppy-dog look, but he does try awfully hard to impress us as sincere and deep. And Mofaz is every bit the nebbish bungler that Larry invariably was. When Ariel Sharon broke away from the Likud to found Kadima, Mofaz in a righteous upstanding pose, sent out letters to all party central committee members assuring them that he won’t take the expedient course because “you don’t leave home.” But before the mailman managed to deliver the envelopes, Mofaz expediently left home. That was just the first in a long list of mishaps, the latest of which included winning Kadima’s top slot only to be dragged against his will, his bravado notwithstanding, to new elections too soon. He next called Netanyahu a liar and vowed vehemently never to enter a Bibi-led coalition. So what if, as we were reading his lips, Mofaz deftly performed an about-face and linked his fortunes to those of Bibi and Barak? It was better than going it alone on the campaign trail and slipping on the proverbial banana-peel-to-end-all-banana-peels. The ensuing embarrassment would have been far more mortifying than even the unkindest sight gag in the meanest of burlesques. Like Larry, Mofaz opted to play it safe and submissive. But for how long? 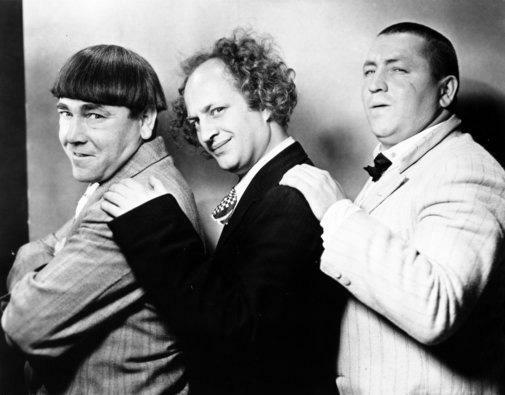 The one sure thing about the Stooges is that in their universe nothing is for sure, nothing can be taken at face value and nothing can be taken for granted. Therefore it’s advisable not to bet on this new team staying united and operating in the harmony they may exude for the short haul. The wild-eyed knife-jugglers are waiting in the wings, sharpening their blades. Now that Bibi has saved them from the voters’ wrath and given them a stay of execution, the hotshots in Mofaz’s rogues’ gallery aren’t running as scared as they did before the grand coalition deal was announced. Without a trace of contrition or humility, they now announce that their goodwill is conditional, that Bibi must meet their timetables, and perform as per their direction or they will pull the rug from under him. Forgotten is the dispensable detail that they were headed for an Election Day disaster while Netanyahu was the unmistakable front-runner. It’s not that they can bring Netanyahu down, but they can wear him down, besmirch and badmouth him with expertise unsurpassed outside Kadima. Knocking Bibi will become the new test for political pluck among the Kadima blusterers. Bibi may well rue the pact he struck. He may well come out hobbled and battered and he’s “soitenly” not as irrepressible as Moe was. Odds are he won’t be the same by the time his new partners are through with him. Their frequent flip-flops don’t recommend them for trustworthiness. Indeed those who lied in the past are likely to do so again. The ease with which they defended their zigzag into the coalition foreshadows the ease with which they’ll proffer excuses for trashing it – whether or not they actually leave. It’s easy to stay inside the coalition while posturing in the mantle of the sanctimonious opposition ideologue. All the while, Mofaz might not only benefit from a breather, he may emerge rehabilitated (to say nothing of the image enhancement which Labor’s Shelly Yacimovich is sure to derive). The bad press which greeted the trio’s premiere will only further motivate Mofaz to second guess Bibi at every opportunity, malign him at every turn and generally undermine him. His experience at saying one thing and switching to its direct opposite without batting an eyelid is practically peerless. Moreover, he’s prone to doing it so senselessly that he cannot be expected to be reined in by coolheaded assessments. The more censorious commentators have a go at Mofaz, the greater will be his inclination to curry their favor, which will be really bad news for Bibi. Therefore, it matters much that the talking heads now talk about a replicated “stinking maneuver.” This despite the fact that their comparison with the 1990 precedent just doesn’t hold water. Three years pre-Oslo, in 1990 – when Israel was governed by the second unity coalition under Yitzhak Shamir – then-Foreign Minister Shimon Peres behaved like a law onto himself. Already then (and not for the first time) he furtively engaged in unauthorized freelance negotiations. He pursued covert assignations with Jordan behind Shamir’s back, in violation of every conceivable democratic principle. The stinking maneuver of 22-years-ago constituted an elaborate scheme to deconstruct a national unity coalition. To apply the same catchphrase to the construction of a national unity coalition is more than misleading. It’s deliberate demagoguery. Besides, it’s instructive to recall that back in the day our Left-dominated media cheered Peres on and deprecatingly rejected Rabin’s disapproval of the stench. Nothing was too foul to oust a Likud leader – then and now. That’s why the press has resurrected Rabin’s harsh headline for the Peres sabotage. It’s not because another stinking maneuver was perpetrated but because nothing a Likud leader does can please most news analysts (unless, like Sharon, the Likud leader grievously injures the Likud). The criterion isn’t whether a coalition is formed or dismantled, but whether or not the Likud is harmed. The Left, which now decries the sudden swerve away from early elections, griped endlessly about these very projected elections because the polls unanimously predicted a Netanyahu landslide. The bottom line beneath the multi-layered left-wing hypocrisy is that whoever teams up with Netanyahu is bound to be whacked by hostile opinion-molders. Mofaz is well aware of this. His image is important to him and he will defend it by making Bibi’s life hell – now that Kadima no longer fears an inconvenient Knesset campaign. Thus it’s doubtful that lasting political peace was secured by sheltering Mofaz from the electoral storm. If anything, Netanyahu will now be subjected to much graver pressure from within his cabinet (in addition to Barak’s) to sacrifice vital national interests to coax Ramallah figurehead Mahmoud Abbas back to the negotiations table. Netanyahu’s coalition partners at home will lean hard on him to deposit a hefty down payment just to get talks going. Similar extortion will be applied almost on every policy front – domestic, diplomatic and defense-oriented. The upshot is that the coalition itself will become the future sparring ground. We will all in all probability witness farcical hijinks in the hallowed name of peace and democracy. Sullen-faced Mofaz/Larry will scramble our brains, while supercilious Barak/Curly will chortle prodigiously with characteristic Stoogian self-congratulation. And, in a reversal of roles, Bibi’s/Moe’s shins will this time be kicked, his nose tweaked and his head continuously bopped. 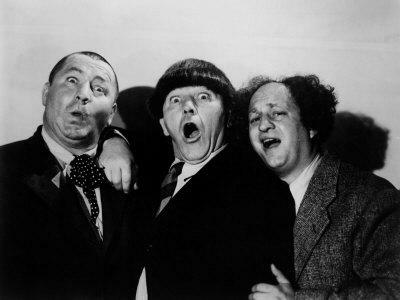 Sarah, I can see the headlines now : “Three Stooges destroy Iran’s nuclear program”. They won’t destroy anything! They have not what it takes nor is the home-front capable to absorbe an eventual back clash…precisely because we have been lead by clowns for decades! Noody, I just LOVE your glimpse into the very near future ! Don’t the three little clowns have to get the ‘green light’ from their producer Hussein O. before they do anything of real substance ? We all know how obedient they are to him for the honor of remaining on the stage for another of their gut wrenching performances. Marcel, this just could be the time they spit in Obama’s eye and go for it. They were saying the same thing about Levi Eshkol in ’67 when LBJ was leaning hard on him. This prediction scares me because it rings so true! Can’t think of any single thing that can cheer us with this pair of self-serving hypocrites who can’t do, can’t teach, can only criticize destructively. The wimp Stengel who is writing for the anti-Israel Time, just crowned King Bibi, hoping that he would actually implement Stengels own pro-Pali politics…in fact Bibi may very well be king, after finishing off Irans illegal nuke program and setting the world stage for the BIG change…! His gaze on the Time cover reminded me of Gary Coopers in “High Noon”…! It is a sign, dear nephew. it is a sign. The respected American commentator Charles Krauthammer thinks the wall-to-wall coalition has been created – like that on the eve of the Six-Day War – in order to attack Iran. I think he’s wrong and you’re right. This manoeuvre shows Netanyahu’s usual lack of assertiveness and deep-seated fears of the media and the judiciary. What wall to wall coalition? Israel acted alone, and was hung out to dry alone. If it wasn’t tragic, I would LOL and even ROTFL (cf. Internet acronyms).